"Loaded with information about the circuits of production and consumption that make up this vast and tangled cultural assemblage, World Cinema: A Critical Introduction deftly maps five prominent nodes of the world cinema network in relation to several significant transnational, regional, and smaller cinematic clusters. Indispensable reading for students of film studies, World Cinema is a rich and engaging introduction to the sphere of world cinema." 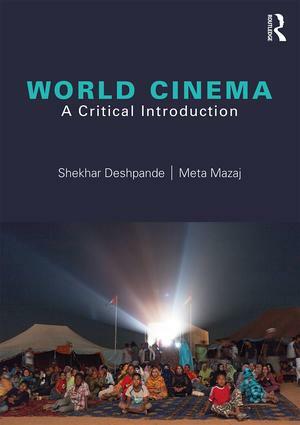 "Shekhar Deshpande and Meta Mazaj’s World Cinema: A Critical Introduction offers an extremely thorough, insightful, and multidimensional analysis of the current state of World Cinema and World Cinema Studies in all their aspects – historical aesthetic, authorial, industrial, and spectatorial. The book constitutes a stupendous achievement -- dense well-researched, well-written and replete with mini-essays on a huge variety of subjects." Shekhar Deshpande is Professor and Founding Chair of Media and Communication Department at Arcadia University, where he held Frank and Evelyn Steinbrucker Endowed Chair from 2005-2008. His writings have appeared in Senses of Cinema, Studies in European Cinema, Film International, Seminar and Widescreen. He is the author of the forthcoming Anthology Film and World Cinema. Meta Mazaj is Senior Lecturer in Cinema and Media Studies at the University of Pennsylvania. Her articles have appeared in Cineaste, Studies in Eastern European Cinema, and Situations: Project of the Radical Imagination. She is the author of National and Cynicism in the Post 1990s Balkan Cinema (2008), and co-editor, with Timothy Corrigan and Patricia White, of Critical Visions in Film Theory: Classic and Contemporary Readings (2010).